Pennsylvania Food Merchants Association members asked for more information on legislative issues. With that knowledge, PFMA staff members designed the 3rd Annual Fall Legislative Conference for you. You will gain new insight and perspective on issues impacting your business. Thought leaders and industry experts will join us to provide their knowledge on issues and upcoming legislation. Jim Glassman - JPMorgan Chase & Co.
Our Keynote Speaker is Jim Glassman, Managing Director & Head Economist for Commercial Banking for JPMorgan Chase & Company. From regulations and technology to globalization and consumer habits, Jim’s insights are used by companies and industries to help them better understand the changing economy and its impact on their businesses. Jim’s work with the firm, and his independent research on the principal forces shaping the economy & financial markets, has earned him features in the media and as an economic commentator. Formerly vice-president of external communications for a grocery retail leader and communications director for PA’s largest state agency, Tracy is a powerhouse of private and public sector know-how. She has been nationally recognized for public relations, reputation management, corporate responsibility & community engagement strategies. 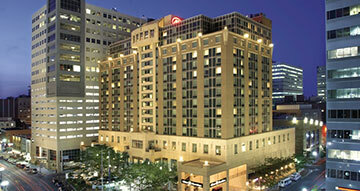 The PFMA room block is full, please call the Hilton Harrisburg to see if they have rooms available.